2JZ GTE Powered Skyline - The Main Attraction at Gatebil Event in Sweden! - Muscle Cars Zone! 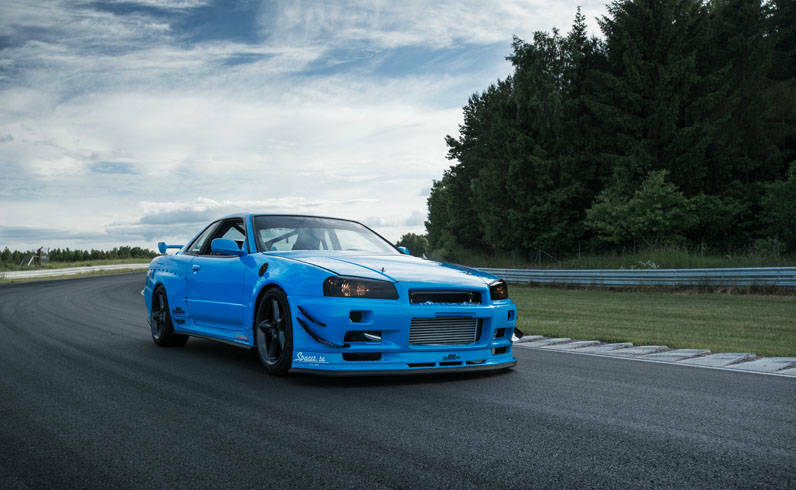 2JZ GTE Powered Skyline – The Main Attraction at Gatebil Event in Sweden! The 2 JZ- powered Skyline was the main attraction at the last Gatebil event in Sweden. It features Toyota 2JZ GTE motor. Yes, sometimes the love for cars turns into obsession or extreme passion. If, for example, you collect parts of cars you don`t need then you might thing about the possibility of being obsessed. The name of the owner of this vehicle is Niclas Forhlund who previously appeared at the Gatebil event with S14 200SX, but he considered the car to be too lazy and not enough perceivable. He wanted to change that. And he did. He did that in the most unusual way. Instead of buying a chassis in order to build the car, like every normal man would do, Niclas bought the motor first. That was not such a bad idea after all, having in mind that the 2JZ engine has high performance regardless of the car it is incorporated in. Initially, Niclas thought of incorporating the engine in a RWD – converted Audi S2. However, all this changed when Niclas found the R34 Skyline that was on sale and without an engine. All came into place. So Niclas bought the R34 Skyline and started working on the engine. You might ask yourselves why. Well, the engine as for itself might have been rather good, but not good enough for the Gatebil requirements. Therefore, Niclas had to alter it and make it more sophisticated by adding stainless steel exhaust manifold, ingnition and converting it to the GT 45. He might have as well simply bought a GT, Niclas does not mind getting his hands dirty for his passion and for making the Skyline the real thing for the Gatebil event. Niclas has done an excellent work putting different cars` parts into one. He used a transmission fo a BMW E46 diesel model. The Brembos brakes come from a Mitsubishi Lancer Evolution X model. The engine is able to 624 hp which may not be that much, but it is far better than the previous performance of the S14`s engine. Furthermore, Niclas used Volvo dash panel. The car is also converted for a left-hand-drive and is made only for track drive. Since it is a racing car, Niclas undertook all necessary safety measures as for example installing a full cage and Driftworks bucket seats. It seems that Niclas has been thinking of everything. That is proven by the fact that Nicals has made his car capable of drifting and normal driving. The only thing he has to change is the tires. All in all Niclas has done a good job with this car, particularly if we take into consideration that the car meets the Gatebil standards. The car may not be the fastest one, the most attractive one or the best one, but we surely appreciate the unconventional way of which it was built.